I had been really looking forward to Friday 22nd February when I was guiding our first ever ‘Great Ridge at Night’ walk from Castleton. For Martin, Charlotte, Sherry and Elizabeth who had booked, it was their first experience of hillwalking in the dark. We were fortunate to have good weather conditions. Although it was very cold (around -5 degrees) it wasn’t too windy and the snow that had covered the hill only days before had almost gone. We all wrapped up in lots of layers of warm clothing and set off up the hillside passing the buildings of Treak Cliff Cavern on the way. 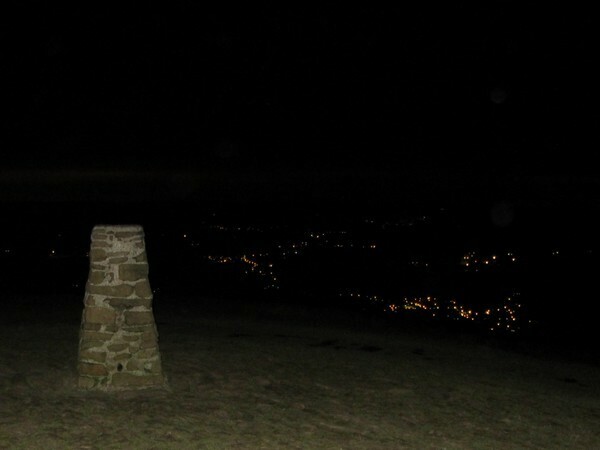 Upon reaching the trig point on the summit of Mam Tor we were treated to the wonderful view of the lights of Castleton down below on one side of the ridge, and of the tiny hamlets within the Vale of Edale on the other side. Although the sky was overcast there was just enough moonlight filtering through to enable us to see the outline of hills in the distance, still speckled with snow. We had an enjoyable torch lit walk along the ridge and as we had made good time, went a little further than I had originally planned and continued as far as Backtor Nook before descending down the hillside on a path into Castleton. The night wouldn’t have been complete of course without a call into a pub and The Castle Inn proved to be a good choice!